OK, maybe little ones are only really interested in Valentine’s Day because of the candy, but that doesn’t mean you can’t help them get in the spirit! After all, there’s nothing quite as endearing as a homemade card. This roundup of 7 Valentine’s Day crafts are adorable and the perfect way to teach little ones all about love. Nothing says “craft time,” quite like a finger painting project! These love bugs are a blast to create and oh so easy. All you’ll need is construction paper, pipe cleaners, googly eyes and some paint. The very little kids might not know what a fluttering heart is, so explain to them that their butterfly is a way they can show how much they care about someone! Check out the full tutorial from Teaching Mama. Don’t forget to show teachers some extra love this Valentine’s Day! This creative gift is sure to put a smile on any teacher’s face. Whether you choose to include a little token gift––a bottle of lotion or yummy-smelling hand sanitizer––or just stick to the paper card, this craft is the perfect way to teach children how to show their appreciation for the important people in their lives. Get the instructions here. As kids reflect on all of the things they love, pizza is bound to come to mind! 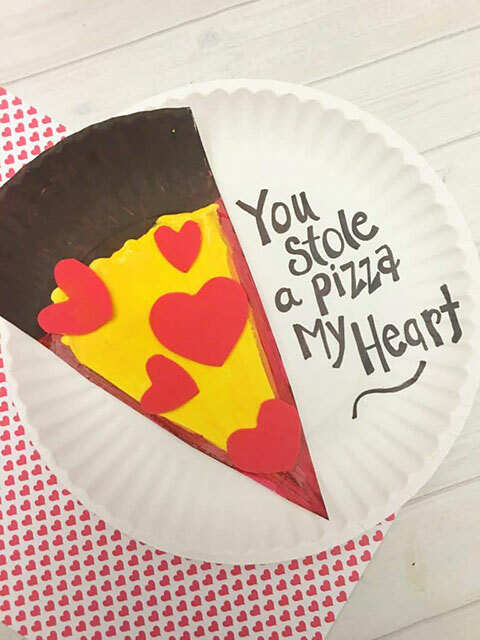 I’m a sucker for a good pun and this one is perfect for Valentine’s Day with kids. Plus, this paper plate craft is great for all ages. Go the extra mile and cut a variety of “toppings” for the kids to decorate and personalize their slices with. Find the full set of instructions on Surviving on a Teacher’s Salary. Show a loved one that their smile lights up a room with this stained glass heart project from PBS! This project is perfect to give to a grandparent or nanny (or mom and dad!) for them to display in their window. The best part about this project is it’s completely customizable without making a big mess. Each child can pick the size of their heart and choose the colors of their tissue paper. Go off-script with unique and original shapes! Don’t get me wrong––I love a good craft, but Valentine’s Day is more fun when you have a sweet treat in hand! These chocolate covered pretzels are as simple as they are delicious. All you need is chocolate chips, pretzels, sprinkles and a little sous chef! Have fun creating the perfect shade of pinks and reds. Find the recipe on Love from the Oven. Valentine’s Day is all about the X’s and O’s! I couldn’t resist including this adorable little guy from No Time for Flashcards in my round up. Cute, easy and a great gift for kids to share with their classmates and friends on Valentine’s Day. The best part? You can get as creative as you want! Bring on the glitter, stickers and gems! Nothing is off-limits, so encourage the kids to think outside the box. Ask them, “What reminds you of a hug?” and see what that inspires! As kids start to develop socially and emotionally, they’ll understand what it means to show someone that they care! For now, this cute heart-shaped owl from Crafty Morning is a great way for kids to say why the love their friends and family. Help them write a sweet note to someone they love and include a reason or two. This is a great exercise for teaching compassion!